INSULATED JACKET FOR EMBRACING THE CHILL. 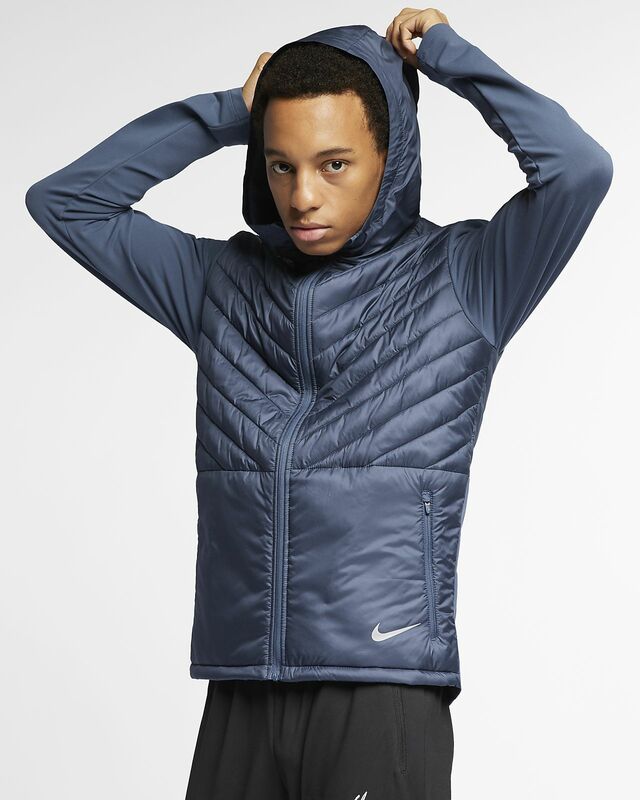 Nike AeroLayer technology utilizes a layer of lightweight insulation between a water-resistant shell and a breathable lining. It fits close to your body to lock in the warmth. A full front 2-way zipper design with mock-neck collar lets you switch up coverage and airflow to your liking. The 3-panel hood fits close to your head to keep out rain and snow. Zippered hand pockets have room for your phone as well as small items like keys and cards. Polyester fill is non-allergenic and provides lightweight warmth without bulk. Spandex blend fabric on lower back panel and sleeves gives stretch where you need it. Fabric: Body/panels lining/fill: 100% polyester. Panels/hood lining: 85% polyester/15% spandex.